This map depicts a small castle, suitable for a town or county. It’s defensible but not particularly fitted for a siege or strong defense. First level features a great hall with a stairway that reaches the library in the second floor. 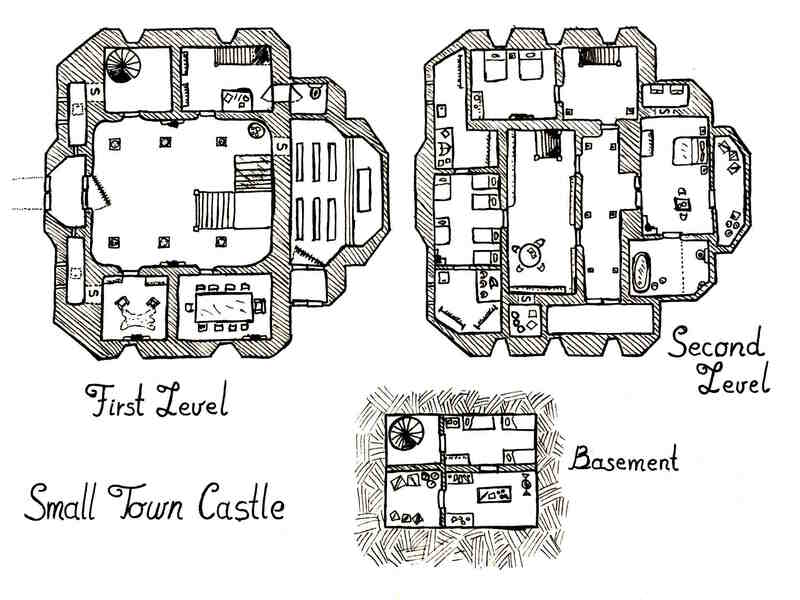 Adjoining the great hall are a den, a dinning room and a small studio with a bathroom. There is also a staircase that goes down to the basement. In the back of the castle there is a chapel, it has its own entrance, although there is a secret door that connects to the main hall. In the second level of the castle, there is a master bedroom with its own bathroom and a storage room, it also connects to a hidden room for keeping important things. There are guest bedrooms and a big library/studio. In the section above the main entrance of the castle, there are sleeping rooms for guards and an armory, there are also shafts that open down to the defensive positions in the first floor, where there are death holes to defend the entrance. The basement contains sleeping quarters for the servants, a kitchen and adjoining larder.